The Humane Society of the United States helped conduct a six-week undercover operation at a slaughter facility in Chino, Calif. These images were taken from a video that came from the investigation. 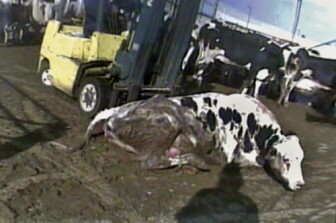 If ag-gag legislation were passed, efforts such as this one may become illegal. After big agriculture companies and other agribusiness organizations recorded some prominent legislative and legal victories in 2013, they are at it again this year with a handful of different issues. Already, policy makers in two states have proposed new “ag-gag” legislation, or anti-whistleblower laws that seek to prevent recording video or shooting photos without permission. Members of Indiana’s state legislature introduced a bill that is similar to a farm protection or ag-gag bill, but the bill’s supporters are not marketing it as such. Rather, due to the high profile media attention and the use of the negative term “ag-gag,” policymakers rebranded the bill as an “agriculture mischief” bill. According to the Humane Society of the United States – which widely opposes ag-gag legislation – the proposed Indiana bill creates a new crime called “agriculture mischief,” designed to stop undercover recordings and photography on farms. The agriculture mischief bill comes after a group of Indiana policymakers attempted to pass a farm protection bill in 2013, but failed. Reports on the bill out of Indiana state that the new agriculture mischief bill does not name specific actions that would be criminalized, which the 2013 version did. New Hampshire lawmakers also attempted to pass new ag-gag legislations after failing in 2013. Policy makers in the state introduced a bill that would have made witnessing animal cruelty – and not reporting it – a crime. The bill proposed giving individuals who witnesses cruelty to livestock 48 hours to report the incident to law enforcement officials. If the individuals fail to report the abuse, they must face a $250 fine. The state legislature tabled the bill on Jan. 22 for later discussion, according to reports. Penalizing individuals who fail to immediately report animal cruelty is not uncommon among ag-gag bills. Also read: "Beef suppliers settle lawsuit over abuse, slaughter of sick cattle"
Many farm protection bills similarly set up 72-hour windows where employees, activists or journalists that have video or audio proof of animal abuse must turn it over to law enforcement officials. Posting audio or video online or turning it over to the media would be illegal, too. In fact, in some cases, failure to turn over documentation of animal abuse could land a person in jail. Taylor Radig was charged with animal cruelty in Colorado in November because she covertly recorded cattle being abused at a Quanah Cattle Company facility. The case received national attention as it was one of the first of its kind. Radig was an animal rights activist with the nonprofit group Compassion Over Killing. 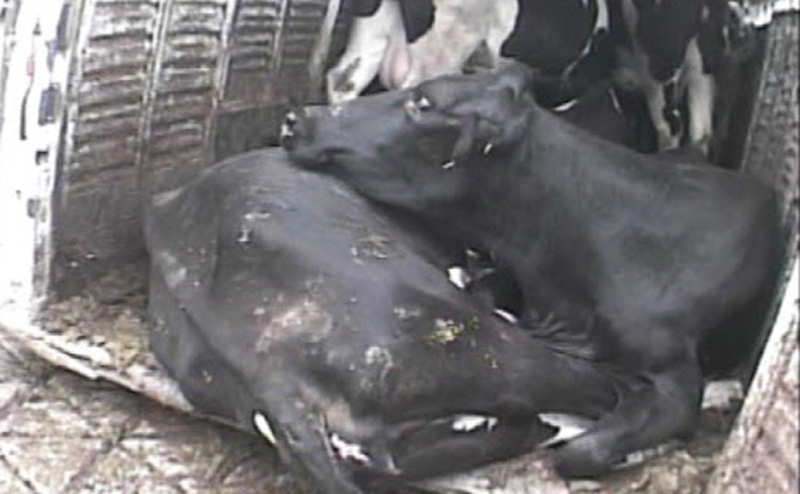 Radig’s video showed calves being kicked and being violently thrown into trucks. Many of the calves were newborns. Radig did not turn over the video or contact law enforcement officials about the abuse at the time it happened. Instead, she waited nearly two months before turning over the footage, which Compassion Over Killing used, according to reports. The U.S. Department of Agirculture bans the use of downer cattle because of health risks. Downer animals are animals that are no longer able to stand on their on power. 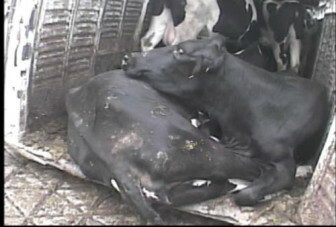 The hidden-camera documentation of these abuses led a major meat recall and multimillion dollar lawsuit. Radig was arrested and charged with animal cruelty, along with three other Quanah Cattle Company workers. Farm owners said they were unaware of the abuse. Compassion Over Killing called the arrest an outrage and an attempt by big agriculture to silence whistle blowers. The Weld County District Attorney recently dropped all charges against Radig. Colorado does not have a formal farm protection law.